This Daily Greens review is not compensated, but the company did send me product for free to try. This post contains affiliate links. If you’re on a gluten-free diet or have celiac disease like me, you know the importance of getting your daily intake of vitamin-rich and nutrient-dense foods. You also know that many gluten-free flours and cereals are not fortified with vitamins like their gluten-full counterparts. Your body demands healthy eating like never before and there’s never been an easier way to do that than with Daily Greens juices. 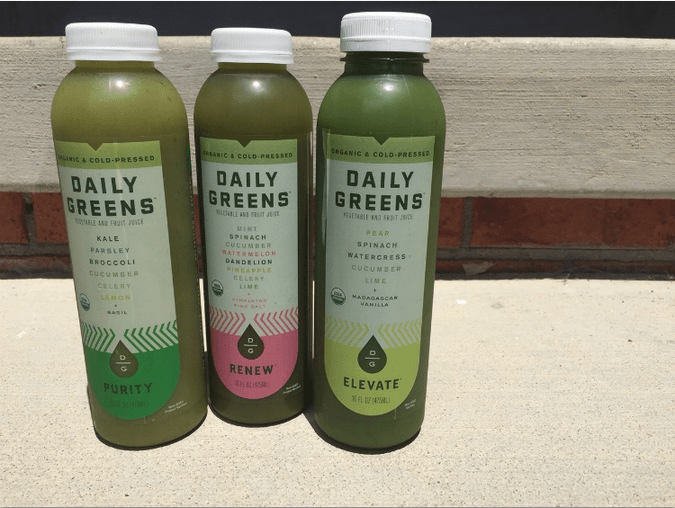 Daily Greens is an organic and cold-pressed vegetable and fruit juice blend that tastes amazing and offers enormous health benefits. 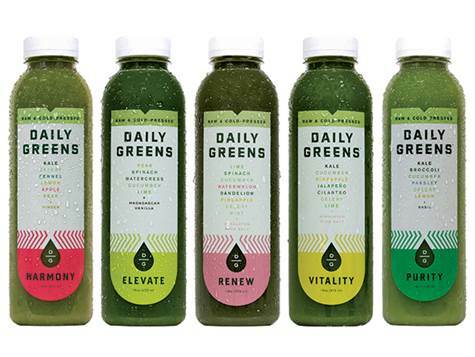 Each 16 oz bottle includes six pounds (9 servings) of pressed raw, USDA Organic Certified and non-GMO produce. Daily Greens is a company I can get behind wholeheartedly! 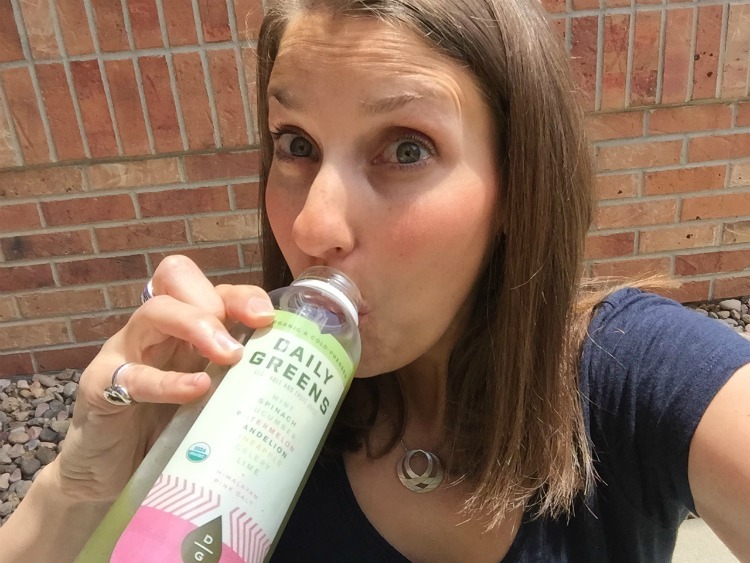 The company’s founder, Shauna Martin, battled breast cancer as a young mom, and soon after discovered green juice and its enormous health benefits in strengthening her immune system and boosting her energy. When an owner passionately cares about something, you know the product is good and made completely with love. I truly believe that the Daily Greens juice formulations are the perfect way to get a nutrient dense snack after a workout (did you know each bottle is a good source of electrolytes potassium, sodium, magnesium, calcium?) and replenishes and hydrates your body without the extra sugar and chemicals contained in other electrolyte sports drinks. It is also an amazing way to stave off disease, manage chronic diseases (like celiac) and make you feel full (I felt full for nearly two hours after drinking Daily Greens!). I’m not just saying these things because I’m writing this Daily Greens review; I’m saying them because I know this to be true! Martin is passionate about doing green juice cleanses as a means to rid the body of unwanted toxins. While I’m not quite ready for a cleanse, you can read more about the Daily Green cleanses in the Daily Greens 4-Day Cleanse book, filled with fabulous juicing recipes. You can buy these little bottles of immunity and joy for $7.99 each at your local grocery and natural grocery stores or order in bulk online. Cheers to strengthening your immune system, boosting your energy, and hydrating your body like never before! I really enjoyed this opportunity to write a Daily Greens review. I hope you’ll give this healthy and delicious product a try! Get ready to feel GREAT! Take my 10-Day Juicing Challenge, and/or get my 10 Amazing Juicing Recipes here. Also, watch my video on how to make green juices at home and juice your way to health!